Being on the other side of the world, Australia always receives polish collections several months later than the USA or Europe, I'm assuming so that the colours match our season. I first saw the Orly Flash Glam polishes on The PolishAholic in early June, but now these polishes will be available in Australia from 1 December 2012. 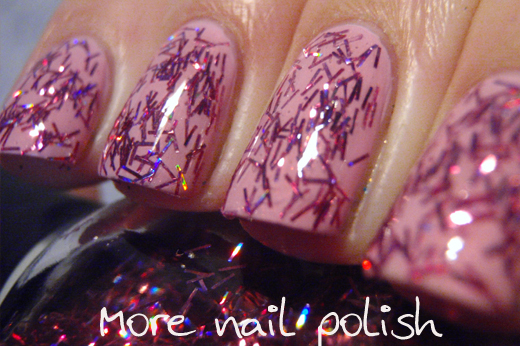 There are a total of 22 glitter polishes in this collection, although five of them appeared in US stores before the others. The five that I know will be available in Australia are: Mermaid Tale, Spazmatic, Can't Be Tamed, Be Brave and Sashay My Way. 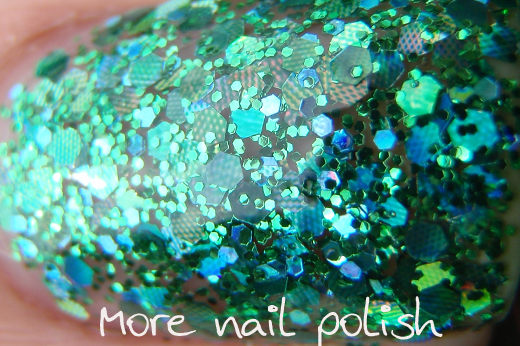 The five polishes are being released here with Orly's black shade, Liquid Vinyl. I have two of the five polishes to show you today. 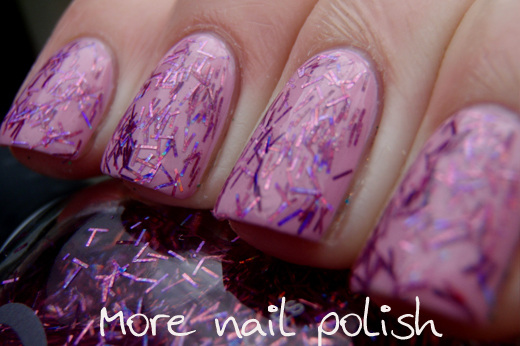 Be Brave - Pink holographic bar glitter in a clear base. 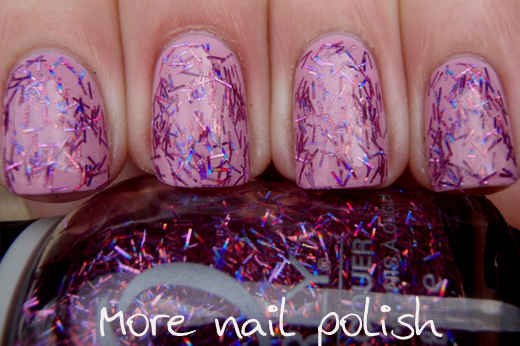 If you don't like bar glitter then your gonna hate this. 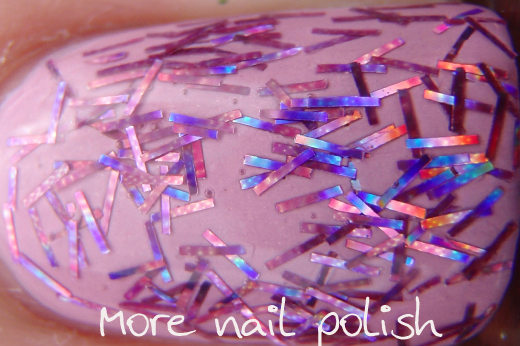 I like bar glitter (except if one hangs off the tip of your nail and scratches the bejesus out of you), and I especially love holo bar glitter. 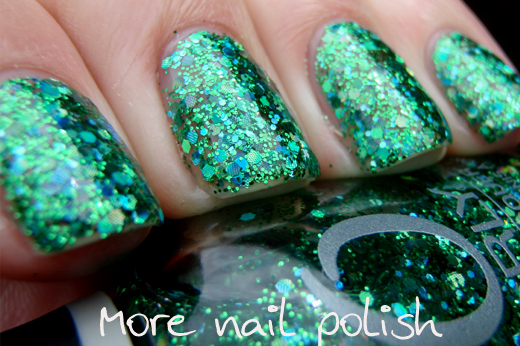 Mermaid tale - This one has a lovely combination of glitters. 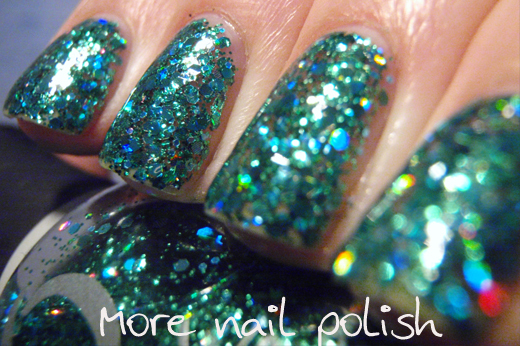 I can't actually tell if it has green and blue glitters, I think they are actually green holo glitters, which means they reflect blue. There are at least three sizes of hex glitter in this, and the macro shot below shows the interesting print on some of the glitters. 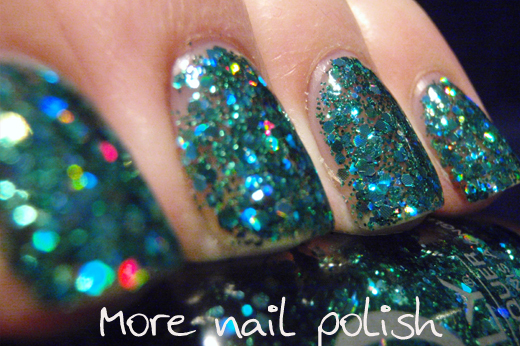 This was three coats of Mermaid Tale on its own. I really wanted to wear this without a base colour and get it opaque. But looking back at these photos I see my nakedness, I really should have put some undies on. This would look stunning over black too. 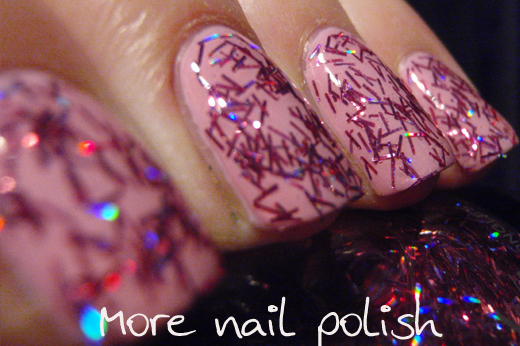 The glitters in this were good and all lay flat with no curling. The formula was thick, but workable. 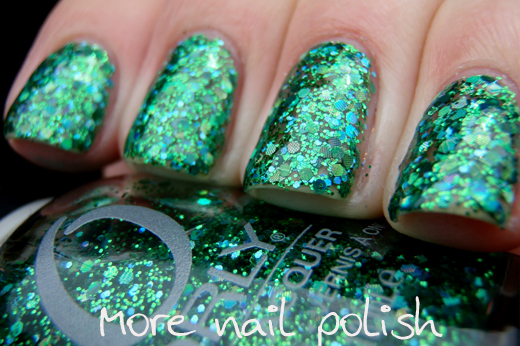 There are some other amazing polishes in the rest of the Orly Flash Glam range that were available in the USA. 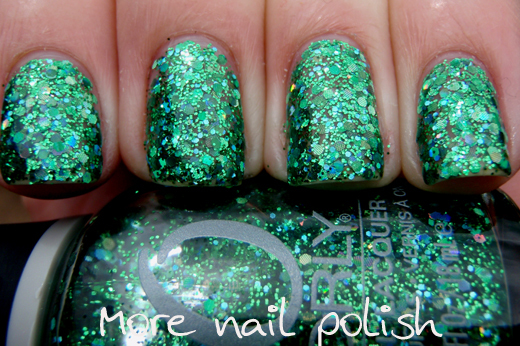 See Let them have Polish to see swatches of some of the others or Orly.com to see all 22. I really hope we get all 22 of these glitters released in Australia. Wow mermaid tale looks amazing, any advice on where to buy in oz? great swatches! The Orlybeauty.com.au website has a list of stockists, or you can call 1300 769 355. Ooooh - they look great!!! I was sent these from the PR company to review, although I have seen Orly at a chemist in Canberra City. As everyone above, love Mermaid Tale and where to get in Sydney?? As mentioned above now, the Orlybeauty.com.au website has a list of stockists, or you can call 1300 769 355. Try Be Brave over China Glaze I'm With the Lifeguard. The pink holo looks really good over the neon green. Thanks for the layering suggestions - I'll try them out.